Since Destiny launched in 2014, we’ve wondered what the game might look like if it didn’t have to run on PS3/Xbox 360 as well as PS4 and Xbox One. 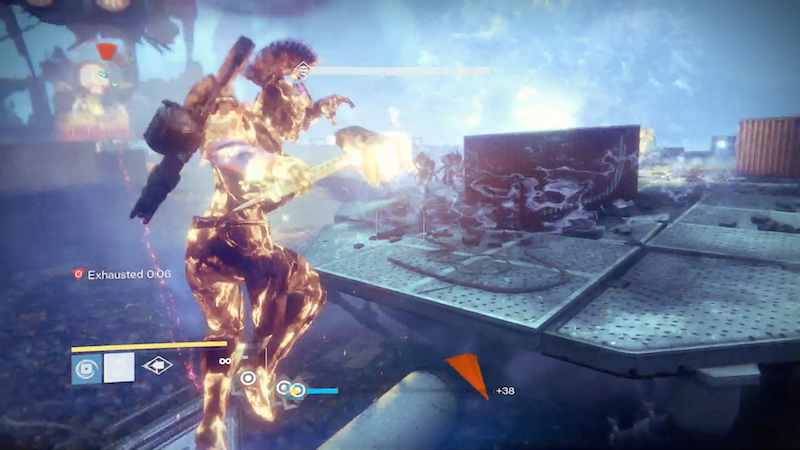 The new Wrath of the Machine raid, which is part of the current-gen only Rise of Iron expansion, gives a pretty good idea. Wrath of the Machine tasks your six-person (or three-person) fireteam with assaulting a corrupted section of the Cosmodrome Wall and, uh... killing... stuff. The story is actually kind of unclear. it’s probably explained on a Grimoire Card somewhere. Anyway, at the beginning of the raid you have to fight a boss to open the outside door, then you fight that boss again in a terrific encounter that culminates in your team sprinting to a “clean room” and hurriedly slamming the door shut to escape evisceration out in the main room. After that, you’ll do some light platforming and come out into the open on top of the wall. In the distance, a monstrous Mad Max-looking war machine fires up its smokestacks and begins to smash its way toward you, crushing everything in its path. So begins the “Siege Engine” section of the raid, and oh man, it is impressive. The machine then breaks down and begins to overheat. You have to venture out into the next area to carry back three parts to repair the engine before it explodes. There’s a twist, of course—you can only carry a part for a few seconds before your character becomes “exhausted” and you drop it. That means you’ll have to trade off carrying parts with the rest of your team, covering your teammates when you’re not carrying anything. While you’re out doing that, a sub-boss reclaims the siege engine and raises the drawbridge, meaning you’ll have to jump on and kill him to lower it and get the parts aboard. You’ll then have to frantically figure out which part goes where, all before the engine overheats and kills everyone. The best part of that video comes about a minute from the end, as our team realizes that the siege engine is about to go over the edge of the wall and leaps to safety. You can’t hear our chat, but it was a mixture of “Do we jump? Do we stay on? What do we do? Screw it, I’m outta here!” Sure, the game gave us plenty of time to get clear, but I still felt like I had been thrown into an Uncharted game. This section of the raid is easily the most technically ambitious thing I’ve seen in Destiny. And while I’m no game developer so I can’t be sure, I can’t imagine something like this would be doable if it had to also run on last-gen consoles. The building-sized Oryx boss from the King’s Fall raid was plenty impressive-looking, but even he was mostly a background object who occasionally threw lightning at you. The siege engine is a huge, moving vehicle that your whole team can ride on. This section also marks the first time I’ve noticed Destiny’s frame-rate chugging. It dipped into what felt like the high teens for me during moments of particular chaos. Not ideal, of course, but a sign of just how far Bungie’s developers have pushed things with this encounter. I’ll have plenty more to say about Rise of Iron and Wrath of the Machine next week. In the meantime, I’ll be happy to replay the first parts of the raid a bunch more times, if only for the guitar riffs.